Over 2,000,000+ people from 176 countries around the world own extraterrestrial property. To date, more than 300 million acres of land on the Moon have been issued to individuals and corporations. It is true. You too can become a Lunar Land Owner by purchasing acres of land on the Moon. 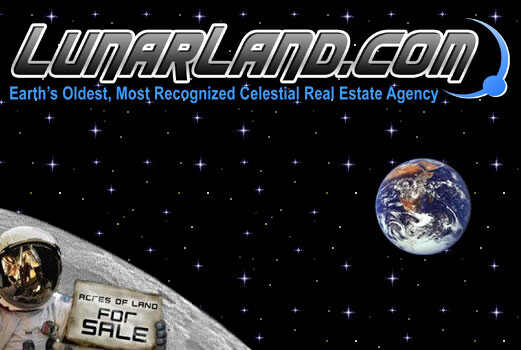 LUNAR Land company is the world’s most recognized Celestial Real Estate Agency and has been selling land on the Moon for decades. 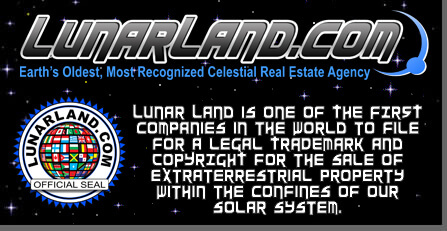 Lunar Land is one of THE FIRST companies in the world to possess a legal TRADEMARK and COPYRIGHT for the sale of extraterrestrial property within the confines of our solar system. Give the top rated gift that is loved by over 250 very well known celebrities, more than 30 past and present members of NASA, 2 former US Presidents and over 2 million average everyday people from around the world. What could be more unique than giving someone an acre on the Moon? For the average person, an acre on the Moon is an excellent gift and great conversation piece. But many corporations such as Marriott have purchased thousands of acres on the Moon for investment purposes, Lunar exploration and future development. • BEWARE of other 'Lunar' Land companies selling Moon property. They might seem legitimate but the Lunar Land is one THE ONLY COMPANY in the world to possess a legal TRADEMARK and COPYRIGHT for the sale of extraterrestrial property within the confines of our solar system. You could be purchasing a worthless piece of paper if you are not purchasing Lunar Land. • Over 2,000,000+ people from 176 countries around the world own extraterrestrial property. 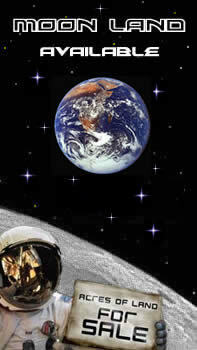 • To date, more than 300 million acres of land on the Moon have been issued to individuals and corporations.